It’s Friday! It’s time for another Friday Feature. 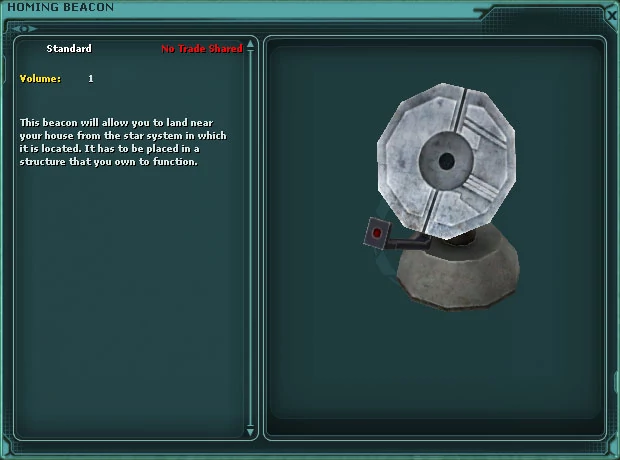 All players who have been part of SWG:Legends for 14 days or more will have the ability to /claim the 57-month veteran reward called the “Homing Beacon” This is an extremely useful device to have in your possession if you are needing to avoid Imperial entanglements at the Mos Eisley starport or simply wanting to get home in a hurry.. The homing beacon allows pilots in the system to land their ships from the space station above their home. Placing the beacon in a house or other building will mark that location as a direct landing spot for any starship. Below is an image of the Homing Beacon being examined by a player. The homing beacon is a No Trade Shared item that veterans can place in any structure they own. This item can be placed in a structure like any other piece of furniture or decoration and will automatically set the structure as a landing zone. Pilots can only land at their home if they are in the same star system as their structure. For example, if the pilot is in Naboo space, he or she is unable to land at their home outside of Mos Eisley. The homing beacon technology is attuned to the veteran only, so the structure can only serve as a landing spot for the owner of the beacon. Other administrators for the building cannot use the homing beacon to land their starships. Picking up the homing beacon or packing up the house removes the area as a viable landing zone, but it can be placed again to re-enable it. We hope you enjoyed this closer look at this veteran reward. If you’ve already claimed your veteran rewards and didn’t select the Homing Beacon don’t worry too much! It may be obtainable once again in the future someday. Last edited by Laviz; 02-08-2019 at 01:24 PM. Is there any possibility that it can be changed so that our other characters can benifit from it? Nope. It is no trade-shared currently and there isn't any current plans to change it. Just a suggestion, but your team should create a quest or some kind of way for this to be obtainable for all toons. I think I missed out getting this with my main when I first started playing. I probably chose something else instead (flight of the vet I think). Regardless It would be fun to have some of those vete rewards assessable like this that are no trade. Perhaps a space mission or duty tokens..just an idea. Last edited by BILLYOCEAN; 08-17-2018 at 03:42 PM. Great idea I 2nd that!!! Each of your toons can benefit from this. It just takes some effort on your part. Each character needs to login, pickup the beacon and place it in their home. Follow suit with each toon until your original toon has recollected it. Then all of your toons will be able to land using the beacon. If this is a bug, please please don't remove it, it is the bestest best bug. Not sure if its necessary or not, but back when I did this for all my toons I also launched and landed at home on each toon before picking up the beacon on the next toon and dropping it in their house. Also if the beacon has already been moved to another house the beacon less house can be moved to another location and its still possible to land at the original house location. If you prefer to launch at the new house location, simply put the beacon back in your house at the new location, launch and land at home. I always do the lauch and land at home just to make sure it sticks. Last edited by dfolkers; 08-19-2018 at 01:15 PM. Yeah, I did as well, just to verify it was working.